Checking in with a few interesting notes on the Michael Vick front. You think that’s too much? Not really if you understand that if they hold on to him and he becomes a free agent in 2011, then signs with another team, the Eagles would probably get a compensatory third-round pick. So it makes sense to ask for a second rounder right now. I’m not sure where Lombardi gets his information, or why he’s so sure the Eagles would get a 3rd rounder. It seems like he’s counting on Vick signing a large deal in free agency 2011 and playing relatively well — as, for example, Asante Samuel did to give the Patriots a 3rd round pick in last year’s draft. That combination of factors seems awfully unlikely to me, but if it’s true, this would be one very good reason to keep Vick around. Read more about how compensatory picks are awarded here. Sam over at IgglesBlog has a great write-up on what exactly it means for the Eagles to keep Vick past the $1.5 million bonus due March 10th. From an Eagles perspective, they are really buying a draft pick for $1.5 million. So in order for paying Vick $1.5 million to make sense, the expected present value of that pick must be $1.5 million, above and beyond what that pick would make in comp. This is something I’ve also been thinking about. Substitute “draft pick” for “deal” in this equation: Later deal > Deal now + $1.5 million bonus. The Eagles would have to be thinking this in order to think about paying Vick. That equation does change based on a number of other factors — such as how uncertain the front office is about who will start under center in 2010, what Vick would net the Eagles as a compensatory pick, whether Andy still loves the wildcat offense. All Vick proved last season is that he could keep his nose clean. Besides, now that he’s being totally honest and telling everyone that he didn’t work as hard as he could have with the Falcons, why does it mean that he deserves a fat new deal and a starting gig? The Eagles may be stuck with Vick until a team loses a starter in training camp. Can’t say I totally disagree. As an Eagles fan, though, I hope some team is willing to take the chance on Vick’s excitement-factor. Oh, and also, Vick seems to like the Panthers’ uniforms. 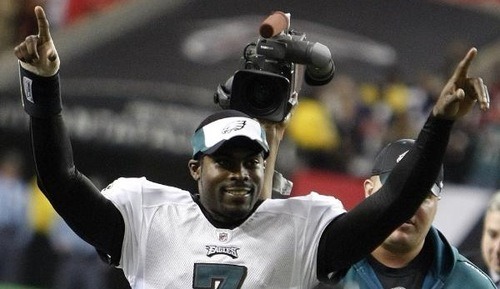 For the record, I think Vick would be ecstatic to be anywhere competing for a starting job next season. Tagged with Michael Vick, Philadelphia Eagles, Trad Rumors, Value, NFL Draft, Compensatory Picks, Trade Market. March 3, 2010 by Brian Solomon.